While celebrity chefs continue to tinker with our tastebuds by transforming airlines into five-star restaurants in the skies, flat beds are also having a major influence on the way we like to fly. Nothing beats a restful night's sleep - crucial before tackling back to back meetings on any international business trip or simply the luxiest way to kick off a holiday abroad. Trouble is you pay a whopping price just to get horizontal which means only high fliers with the financial means have benefited from a bed at 35,000 feet - until now. 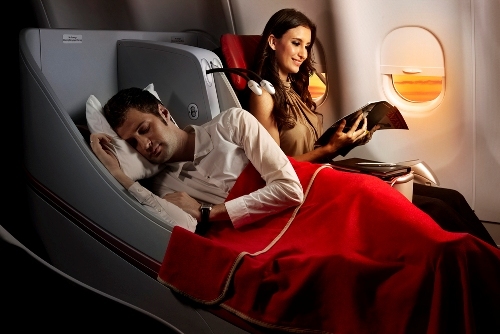 The international arm of Air Asia ( Asia 's leading and largest low-cost carrier based in Malaysia) known as Air Asia X is the first budget airline to offer flat beds on a premium service on its routes including aircraft flying from the Gold Coast, Melbourne, Sydney and Perth in Australia to Kuala Lumpur and from KL to major cities like Paris, Mumbai, Tokyo and Osaka - to name just a few. "The great thing about our flatbed seats is they offer standard business class specifications but without the standard business class cost [it is in fact about half]," CEO Azran Osman-Rani said. "We've been encouraged by the fantastic response (by both business and leisure travellers) and Air Asia will continue evolving and reinventing itself to keep in front of the pack with similar innovations in the future." Mr Osman-Rani said. It's no surprise to find this attitude has won the airline the title of World's Best Low Cost Airline by Skytrax in its annual World Airline Survey for three consecutive years in 2009, 2010 and 2011. So we at The Luxury Travel Bible thought we'd embark on a little road (or should that be flight) test of our own to see how Air Asia X's premium service really rates against the big guns. Here's what we thought about the service and the sleep. The Check-in: A large group travelling with bikes (wrongly) commandeered the premium check-in counter when I arrived. Noticing my dilemma I was swiftly served at the adjacent counter by a friendly staff member and within two minutes of tagging my bag with a 'high flier' tag to ensure it came off first at the other end (which it did) I was heading to the departures gate. Premium seat guests enjoy such privileges such as pick-a-seat, priority check in, priority boarding, priority baggage and baggage allowance (up to 20kg). The Cabin: Passengers are greeted by smartly dressed air crew (impeccably groomed ladies in red with skirts and zipper jackets with fashionable ¾ sleeves, men in black suits with zip jackets and full length sleeves) and welcomed with hands clasped in prayer position and a slight bow of the head. The crew were dressed to match the modern cabin interiors which have a definite (and attractive) oriental vibe about them thanks to splashes of vibrant red amongst a mainly grey decor. The Seat: A smart complementary mix of charcoal grey fabric with flecks of red embroidery covered the seats which were also furnished with red leather headrests which my head (I'm a smidge over five feet ) actually reached when I sat down enhancing my comfort like no other airline has before. There were only 12 flatbed premium seats taking up the first two rows (there are 365 economy seats) of my Airbus A330 aircraft (the new configuration for the airline's A340 aircraft on the KL-London sector is 18 flatbeds and 309 economy seats) so it really is a case of first in (to book ) best dressed! Those lucky to score the pointy end will find the seats have standard business class specifications of 20 inch width, 60 inch pitch and stretch out to 77 inches in full recline position. Each features universal power sockets for a variety of electronic gadgets, adjustable headrests and footrests and built-in personal utilities such as foldaway tray table, reading light and privacy screen. A small pocket allowed me to stow a bottle of water and toiletries. Buttons for lights, assistance and to adjust the seat were easily accessible on the armrest and a lower side panel. Fully flat out I did feel like I was sliding down the bed a little but I managed a decent and comfortable kip (albeit sans mood lighting) tucked up with pillow and doona-style blanket as we soared above Timor and the southern tip of Borneo on my nine-hour Gold Coast to KL journey. The Entertainment: It might be wise to pack a good book in your carry-on. There's a small selection of onboard movies and TV shows and portable playstations also feature games and digital comics. The Eplayers cost RM35 (about AUD$10) to hire and you can save more by booking one ahead online. You can indulge in a little retail therapy with Duty Free items available on board through the Sky Shop offering the usual array of designer brand perfumes, cosmetics, jewellery, alcohol and sweet gifts. The Food: To expect a glass of French bubbles after boarding was naturally going to be a little ambitious. Premium guests do however enjoy a complimentary meal - unlike their peers in coach. There's a wide choice of western and Asian dishes (including vegetarian) which you can pre-book online. The menu comes with helpful pictures and an explanation of ingredients, including an indication of the level of heat in the spicier options - which I thought was very considerate for sensitive Western palates. I chose a spicy traditional Malaysian dish and was very appreciative of the bottled water that came with it! Drinks (apart from bottled water) and snacks offered throughout the flight cost extra. Premium passengers are served first. Final wing tip: Be prepared. It's not uncommon when travelling with a budget airline to find yourself guided out the doors and onto the tarmac to board the plane. This was the case which proved a little uncomfortable when light rain started to fall. With Asia prone to monsoon-type conditions it begs the question - what do they do when the skies really open? NB: Since my flight Air Asia has also introduced the Empty Seat Option in Economy class giving passengers a chance to get all three seats in a row for a nominal fee (and a better night's sleep).